Consultants, managers and team leaders can use it to build project templates and goal setting worksheets for reuse in future similar activities. I had used Goalscape in the past, and without a real need for it, felt it was mediocre at best. However, when I found myself in a crisis, under pressure to accomplish way more than most people can accomplish in a short time, I found myself returning to Goalscape instinctually. There is no other app out there that allows you to budget your time and set priorities in an easy to comprehend way under a time crunch like Goalscape does. However, that is only the BEGINNING of the story. I happened to be trying to get the software at a time right when they re-vamped their entire website and business model to be cloud-based and subscription-based. I bought the software subscription, but, after trying everything within reason, could not download the app (as is expected when a new website launches in the first few hours). I went to bed and when I woke up, someone had already responded to my request for help and was on it for the entire day until we found a solution. He finally sent me an attachment file that downloaded the software perfectly. BUT, that's not even where the story really begins either: During the course of our conversation, I mentioned in passing that I had previously purchased a Goalscape Desktop license (which at the time had a promise of unlimited updates but no online service attached to it). The guy who helped me download the software tracked down that subscription, without my asking, found it under a different email address and transferred it to the new account I made all on his own innitiative. THEN, he told me that I was to be "grandfathered" into the system as a desktop user and that, while new customers must maintain a subscription to get software updates, I could cancel my subscription and keep my old user license with unlimited upgrades (which he so kindly attached to my new account). THEN, he offered WITHOUT MY ASKING, to refund my $99 dollar subscription fee if I wanted to cancel it and just get free desktop upgrades for life. So not only did this person (and the company as a whole) honor a promise they made to me and their other customers as a startup, but they were generous enough to refund me for my new subscription even though I never broached the issue myself! That is one incredible company! BUT IT DOESN'T STOP THERE! Even after this, it came up in conversation that I only had one "user license" left from my old subscription. I told the person I had been working with that I had wiped the hard drive of my old computer and sold it. He took my word for it and MANUALLY added the second device license back into my account and explained that in the future, when I need to change machines, I need to uninstall Goalscape alone first to recover the license for use on another machine. So now I can use Goalscape with free upgrades for life FOREVER, even when I change machines. Now that's customer service... I just want to say as an ending remark that I am very happy to know that there are people out there like those who work at Goalscape, so even if a copy-cat comes out with a duplicate one day, just know that these guys are incredible people and deserve your patronage. They are also working very hard to improve their product and will be coming out with major improvements in the near future, from what I have gathered. So get in on it before demand pushes their prices even higher! They have a great deal with a $99 yearly subscription. That's less than $10 dollars a month. Less than Netflix or Hulu Plus... -- Goalscape has incredible customer support and the staff will go above and beyond the call of duty to help you. -- Goalscape is already an incredibly powerful tool for determining priorities, budgeting time or money, or just for brainstorming when you need a visual aid to help you think about the things in your life. -- Goalscape can be useful to many people for personal projects as well as to collaborate with students or other people if you are a coach or social worker. And while roughly one hundred dollars seems like a lot at first, that's less than ten dollars a month when you break it down. It's affordable and you will get help when you need it, even if someone has to override system protocols to do it. -- Goalscape is working on MAJOR improvements to their software, including allowing users to customize the field that represents what the percentages of circles mean, allowing users to color code or possibly even gradate colors of different pieces of the "pie" so that one can see multiple dimensions of their project (for example, size in the circle could represent time, while segment color gradated from white to red or green or any other color cold represent importance). The color palate may end up being able to even represent 4 or more dimensions to the project (i.e. the four psychologically basic colors: red, green, blue and yellow). -- Goalscape has incredible customer support and the staff will go above and beyond the call of duty to help you. -- Goalscape is already an incredibly powerful tool for determining priorities, budgeting time or money, or just for brainstorming when you need a visual aid to help you think about the things in your life. -- Goalscape can be useful to many people for personal projects as well as to collaborate with students or other people if you are a coach or social worker. And while roughly one hundred dollars seems like a lot at first, that's less than ten dollars a month when you break it down. It's affordable and you will get help when you need it, even if someone has to override system protocols to do it. -- Goalscape is working on MAJOR improvements to their software, including allowing users to customize the field that represents what the percentages of circles mean, allowing users to color code or possibly even gradate colors of different pieces of the "pie" so that one can see multiple dimensions of their project (for example, size in the circle could represent time, while segment color gradated from white to red or green or any other color cold represent importance). The color palate may end up being able to even represent 4 or more dimensions to the project (i.e. the four psychologically basic colors: red, green, blue and yellow). -- Goalscape does not have the features I mentioned and it may take time for all the improvement to be implemented -- Goalscape relies on Adobe Air and Flash as a way to be cross-platform and the is at the mercy of Adobe's mistakes. HOWEVER, they ARE working on developing self contained apps for Mac OS X, Windows and possibly other formats. So keep an eye out for those improvements. I use Goalscape to: - project management - sales management - planning & presenting actual office projects - create knowledge bases - present tree diagrams as scape diagram with contextual information Goalscape gives opportunity to manage in visual way. We can create diagram of structural data with elements like: - importance - progress - responsible - tags - dates. We can add : - notes - attachments. We can see data as scape diagram and as matching goal list or as a table. To create visual "tags", Goalscape has option to add colours to scapes and color dots to filter them later. It's possible to export diagram as: - PDF - docx - xlsx - goal map vector - goal map bitmap - csv data - MS Project - MindManager We can import: - Goalscape csv - MS Project XML - MindManager. Goalscape gives opportunity to manage in visual way. We can create diagram of structural data with elements like: - importance - progress - responsible - tags - dates. We can add : - notes - attachments. We can see data as scape diagram and as matching goal list or as a table. To create visual "tags", Goalscape has option to add colours to scapes and color dots to filter them later. It's possible to export diagram as: - PDF - docx - xlsx - goal map vector - goal map bitmap - csv data - MS Project - MindManager We can import: - Goalscape csv - MS Project XML - MindManager. It's easy to start to use this software. Not to many options and great to manage in visual way. 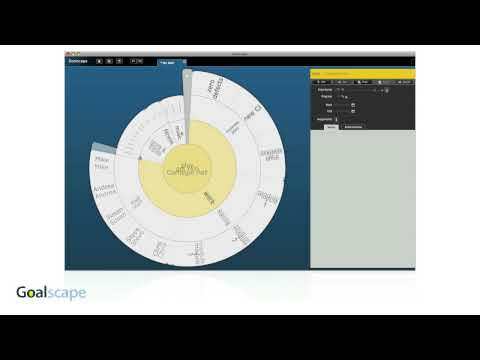 It's easy to create scapes as creative work or import input data to manage it later. I love import/export with MindManager as power-user - it's great to be able to present information in many formats without creating them from "zero". Thanks for the marvellous review. Goalscape is indeed the ideal way to define all your goals and set your priorities *visually*. And seeing your progress shading advance across the goal map really reinforces your motivation ¿ some people even take a screenshot every week and scroll through them like a flipbook. Goalscape - sorts you out! I'm a very busy person with lots of projects on the go. Problem is that I try to do a bit of everything all at once, multitasking if you like. However, as we all know, multitasking doesn't work very efficiently. Audiobooks, books, pen and paper, spreadsheets..... Hectic! Then a quick Google search for "Goal Planning Software" and I came across Goalscape. Flashy, smooth, interactive, flexible, dynamic and ultimately SIMPLE! Goalscape can be used in all walks of your life, whether it be business, project, sports, life planning, career.... Goalscape works for everything! Register for an account and use the online web software, or download the desktop software or even use it as an app on your phone / tablet! Very versatile. There are templates that you can load in and tweak to suite your circumstances. Goalscape has helped me map out my various sectors that makes up my life. I can then sub divide these and see what I'm spending too much time on and what I'm completely missing out on. The Goalscape model restores balance and harmony to my life. Smooth, simple, versatile, portable, quick to get into. Nice help guides and videos to show you how to do things. Smooth, simple, versatile, portable, quick to get into. Nice help guides and videos to show you how to do things. As you add more and more sub goals, they get smaller and smaller on the main model. The navigating round and trying to remember which tiny sector is what, can be tricky - especially if you manage to put Goalscape down for a week! You can double click over a minute sector, but if that is the wrong one, then you need to click back out and click in on another one. Maybe a hover over and zoom feature similar to photo galleries when online shopping. There is now a Goalscape Free option: use the cloud version for ever at no charge; create 1 project (35 goals max) and share it with as many people as you like. To create more or larger projects, upgrade to Goalscape Unlimited for just $99 a year. As the name implies, there is no limit to the number and size of projects you can create and share. Unlimited customers can even share a large project with Free users, allowing them to access the entire project and (if granted Edit privileges) update it. So business users can buy one Goalscape Unlimited subscription per team: the manager can create a project of any size and share it with every team member at no extra cost. Everyone has aspirations; whether they are subconscious, implicit, explicit, even accidentally prompted consequential aspirations. And, 'goals' are the means to attaining your intended aspirations. This is different than tasks I use a task management system and that's great, but attaining aspirations has always been a different sort of thing that I didn't manage. Then I found GoalScape. There is a natural goal-down into individual objectives that somehow parallels strategies-down into tactics. GoalScape's structure follows that construct perfectly. The interfact to accomplish this is a bit novell, but is easy to understand and adopt. Now I use GoalScape to my small team goals as well. This is a very functional practical tool for me.Naturally applied to manage the capture/monitor the attainment of goals. Easy to use. Native desktop, and mobile versions/operation as well as the web/SaaS. Naturally applied to manage the capture/monitor the attainment of goals. Easy to use. Native desktop, and mobile versions/operation as well as the web/SaaS. - Unorthodox user interface - (after very short use operation is understandable/functional). Thanks for the great feedback! Goalscape's unique multi-level pie chart 'goal map' UI is certainly a unique – we are glad you quickly found it easy to use. There are Infopoint videos in the software itself to explain the major functionality (as well as online Help). The web application Goalscape Connect (https://connect.goalscape.com/) is the ideal solution for teams working on shared projects. It provides some cool collaboration features like presence and update indicators and Goal Chat (per-goal IM with inline attachments and email notification options). The free Goalscape Mobile app (https://itunes.apple.com/us/app/goalscape-mobile/id914788791?mt=8 and https://play.google.com/store/apps/details?id=com.goalscape.mobile) is a companion app for Goalscape Connect: it syncs with your online projects to deliver goals and tasks to your phone. Goalscape Unlimited Online: $6 per month. Goalscape Desktop license + 6-month Unlimited Online: $60 one time, non-recurring. Goalscape Enterprise: Starts at $1,600. Goalscape's simple yet powerful visual model provides a rich, meaningful overview of any information structure without losing sight of the detail. It matches the way the brain works in breaking down large, complex subjects into smaller, more manageable parts; so it is immediately comprehensible. The software has an engaging and intuitive interface that makes it exceptionally easy to use: absolutely no training required. Having specific, inspirational, well-expressed goals is the most significant factor in motivating ourselves and others. Moreover a complete structure of goals and subgoals reinforces a systematic, effective, focused approach. So Goalscape is an essential tool for ambitious individuals and organizations who want to achieve anything worthwhile. The circular 'multi-level pie chart' reinforces the fact that resources are limited – especially time. It displays the Relative Importance of each subgoal as the size of its slice, so when you make one subgoal bigger (more important) all the others must become smaller (less important). This provides an instant, clear representation of project priorities. Goalscape supports all goal-directed activity, from brainstorming and ideas sessions to presentations and workshops. Best of all, you can use the same goalscape for the project itself: it supports detailed scheduling and planning, including roles and responsibilities, metrics and milestones. Progress is shown as shading on the goal map: progress in subgoals reflects up into their parents in proportion to its importance. So you can see straight away how you are doing in different areas and overall: any large goals that are not being filled in demand attention! There are many other useful features, including file attachments; smart search; a highlight facility to show goals with common dates, responsibilities or tags. And there are 'Infopoint' tutorial videos available in the software itself that explain all the major functions. Goalscape is integrated with other tools like MS Project, MindManager and Basecamp and sophisticated reporting functions for exporting Goalscape information in PDF, DOCX, HTML, XLSX and CSV. There is also a Cloud version, Goalscape Connect (see separate listing) and a companion iPhone app (which is free). Below are some frequently asked questions for Goalscape. Q. What type of pricing plans does Goalscape offer? Q. Who are the typical users of Goalscape? Q. What languages does Goalscape support? Q. Does Goalscape support mobile devices? Q. Does Goalscape offer an API? No, Goalscape does not have an API available. Q. What other apps does Goalscape integrate with? Q. What level of support does Goalscape offer? Q. Which apps is Goalscape compared to most often?